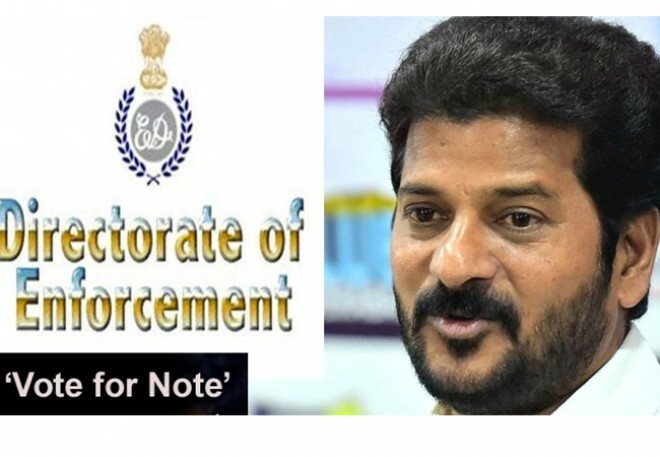 After being questioned for hours by the officials of the Enforcement Directorate (ED) for the second consecutive day, Congress leader Revanth Reddy interacted with the media after the questioning was over. Coming to details, The Telangana Pradesh Congress Committee (TPCC) working president Revanth Reddy is the main accused in the "Cash for Vote" scam and was caught red-handed by the Anti Corruption Bureau (ABC) offering bribe for votes in 2015. During the media interaction, Revanth Reddy said, "The Modi government is trying to nail Naidu through Telangana Chief Minister K. Chandrasekhar Rao. Before the state elections, I was questioned by income-tax officers and the case has once again surfaced before the Lok Sabha elections." A controversial audio tape of Andhra Pradesh Chief Minister N. Chandrababu Naidu's alleged telephonic conversation with Stephenson also surfaced during the official probe. The TRS had alleged that Naidu was the brain behind 'cash-for-vote' scam. "After facing several repeated questions by the ED officials, I noticed how the relationship between KCR and Prime Minister Modi has got strengthened," Revanth Reddy added. Back in 2015, Revanth Reddy was a leader in Telugu Desam Party (TDP) and was caught by the ACB bribing MLA Elvis Stephenson with Rs 50 lakh and offering 5 crores for his vote. Revanth's aides who were arrested along with him in 2015, were also questioned by ED officials over the case last week.